The days are cooling off, the nights are feeling pretty chilly, which means it’s officially soup season! I recently got an immersion blender, and just had to use it, and tomato soup seemed like the perfect way to test it out. Turns out it’s amazing! Possibly my new favorite kitchen appliance. So easy and effective, I totally recommend buying one if you make a lot of creamy soups and sauces. Anyway, delicious soup recipe below. Happy first day of fall!!!! Heat oil in large saucepan over medium. Add onion and cook until tender, stirring occasionally, about 3-4 min. Add garlic and tomato paste. Cook, stirring constantly for 1 1/2 min. Add tomatoes, broth, OJ, bay leaf, 1/2 of fresh basil, dried basil, paprika, and red pepper flakes. Bring soup to a boil, reduce heat to low, and simmer covered for 15 minutes. Remove the bay leaf from the soup. Add the creamer and parmesan cheese. Use your immersion blender to purée the soup right in the pot. Amazing right? No hot soup spilling on the way into the blender, it’s like magic. Anyway, once the soup has reached desired smoothness, you’re ready to serve! Top with the additional fresh basil and parmesan cheese, if desired. 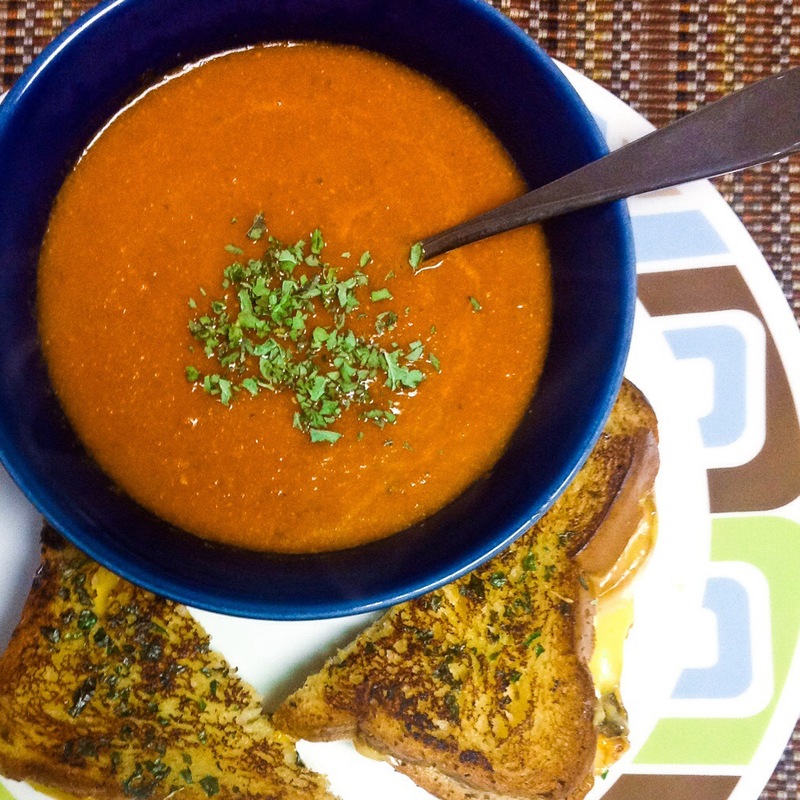 I served the soup with a gluten-free garlic grilled cheese sandwich. So good. To make it, just go through the usual grilled cheese steps, but once you spread butter on each slice, sprinkle garlic powder and dried basil over the butter. Grill in a skillet, and dip it in your soup for a fall food mouth party! Also, photos for the next few weeks might be less than perfect. My DSLR is broken, heading to the shop, so I have been taking food pictures with my iPad! Inspiration for this recipe comes from the cookbook “125 Gluten-Free Vegetarian Recipes” by Carol Fenster.